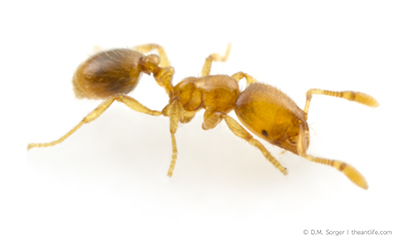 The thief ant (Solenopsis molesta). Photo credit: Magdalena Sorger. Click to enlarge. The paper, “External immunity in ant societies: sociality and colony size do not predict investment in antimicrobials,” is published in the journal Royal Society Open Science. Co-authors include Omar Halawani, a graduate student at NC State; Bria Pearson, a former undergraduate at NC State; Stephanie Mathews, a former postdoctoral researcher at NC State who is now on faculty at Campbell University; and Margarita López-Uribe, a former postdoctoral researcher at NC State who is now on faculty at Penn State University. The work was done with funding from the Triangle Center for Evolutionary Medicine and the National Science Foundation under grants 1523817, 0953390 and 1319293. Abstract: Social insects live in dense groups with a high probability of disease transmission and have therefore faced strong pressures to develop defenses against pathogens. For this reason, social insects have been hypothesized to invest in antimicrobial secretions as a mechanism of external immunity to prevent the spread of disease. However, empirical studies linking the evolution of sociality with increased investment in antimicrobials have been relatively few. Here we quantify the strength of antimicrobial secretions among 20 ant species that cover a broad spectrum of ant diversity and colony sizes. We extracted external compounds from ant workers to test whether they inhibited the growth of the bacterium Staphylococcus epidermidis. Because all ant species are highly social, we predicted that all species would exhibit some antimicrobial activity and that species that form the largest colonies would exhibit the strongest antimicrobial response. Our comparative approach revealed that strong surface antimicrobials are common to particular ant clades, but 40% of species exhibited no antimicrobial activity at all. We also found no correlation between antimicrobial activity and colony size. Rather than relying on antimicrobial secretions as external immunity to control pathogen spread, many ant species have likely developed alternative strategies to defend against disease pressure.